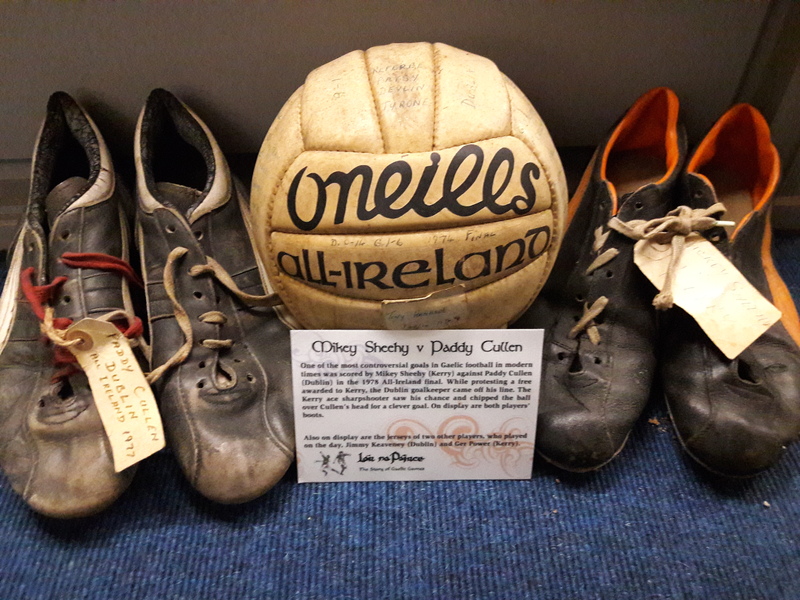 Side by side in one of the display cases in Lár na Páirce are the respective football boots of Mikey Sheehy and Paddy Cullen, the two players who dominate the conversation whenever the All-Ireland football final of 1978 in mentioned. Both pairs of boots are made by Puma, the only difference being that the Sheehy pair have orange markings, while the Cullen pair have white. As well the Sheehy pair are size 10, while the Cullen pair don’t give a size but they look bigger. One of the Cullen boots is signed in neat handwriting: Paddy Cullen, 1977, while there is no signature on the Sheehy pair. The episode between the two players in the 1978 All-Ireland final happened just before half-time. Dublin had the best of the exchanges early on, but Kerry had come back with a goal in the twenty-fourth minute to leave them trailing by just one point. Kerry were attacking, and Paddy Cullen came out of the Dublin goal to clear the ball. As he did so referee, Seamus Aldridge, blew for a free. Nobody knew for what and the referee never revealed what it was for afterwards. Some thought that Cullen had picked it off the ground, others that he had brushed unnecessarily against Ger Power, and the couple had a few earlier incidents between them. The goal put Kerry ahead by 2-3 to 0-7 and they went on to rout Dublin in the second half and win by 5-11 to 0-9. As well as the humiliation of the defeat, Paddy Cullen has had to endure seeing his humiliation repeated on Facebook thousands of times since then. The incident overshadows everything else about the game, the huge score, the start of Kerry’s four-in-row, the end of the great contests between Kerry and Dublin, which had brought such excitement to Gaelic football during the seventies, and the fact that Eoin Liston scored 3-2 in the game, the highest recorded score in an All-Ireland final since Frankie Stockwell scored 2-5 in the 1956 decider.